Perfect for any special occasion. Set of 20 beautiful cards with white envelopes, elegantly boxed. Includes 7 "Dreams of Lotus" cards, 7 "Relaxing Moment" cards, and 6 "The Magic Flutes" cards. Blank inside. Dawn tints the morning sky in shades of rose, illuminating the serene figure of a woman sleeping amid pink lotus blossoms. Reclining on cool grass, a woman looks toward the horizon - where fertile fields of emerald rice merge with the distant sky. A river parts the landscape, kissed by a golden sun, radiating spiritual peace. Two beautiful Balinese women play sweet melodies on their magic flutes. Verdant rice paddies grace the background. 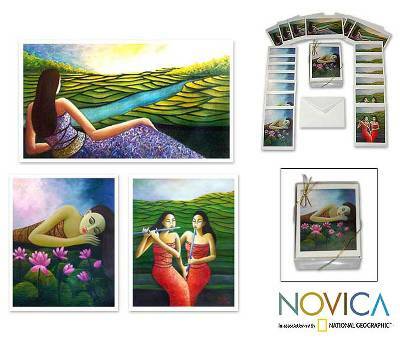 Novica.com features the original works of A. Sofyan and thousands of other fine artists and master artisans from developing nations around the world. We hope you enjoy these beautiful greeting cards; the images were dreamed up by some of our favorite painters. I used the Novica Greeting Cards for my previous holiday card. The artwork and thought behind the design made for the perfect non-denominational card. I bought ""The Dove"" cards that feature the work of the artist Theus. I love his use of color and the sweet faces of his creatures. Looking at his art gives me a sense of hopefulness.